So, she picked the purslane. I couldn’t help because I was snapping her beautiful hands at work. 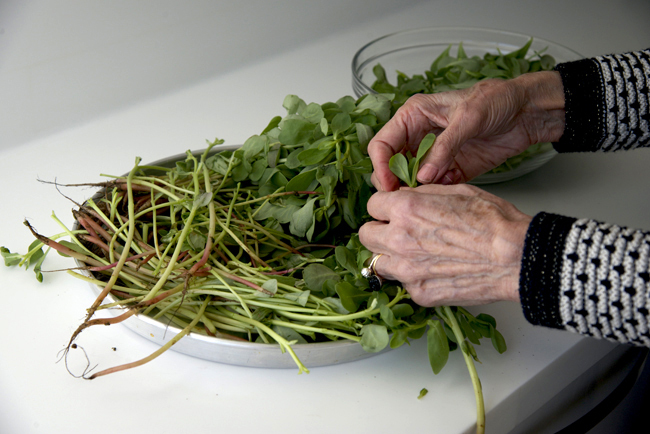 And if it were me, I wouldn’t have washed the purslane because I find the leaves quite delicate and they would bruise if you spin them dry but my mother insisted and she dunked the leaves a few times in cold water before draining them. She then added new season sumac, which I had bought from Emile — those of you who follow me on instagram would have seen the picture! After that she salted the chopped onion to soften them. 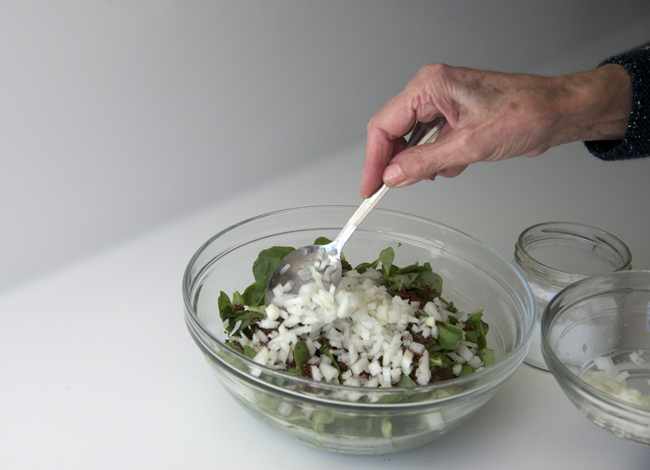 She then added the onions to the purslane. 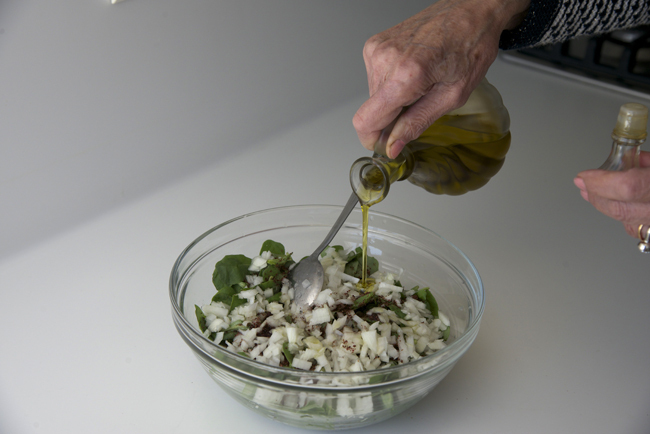 And added a fair amount of very good olive oil which she gets from friends in the south. 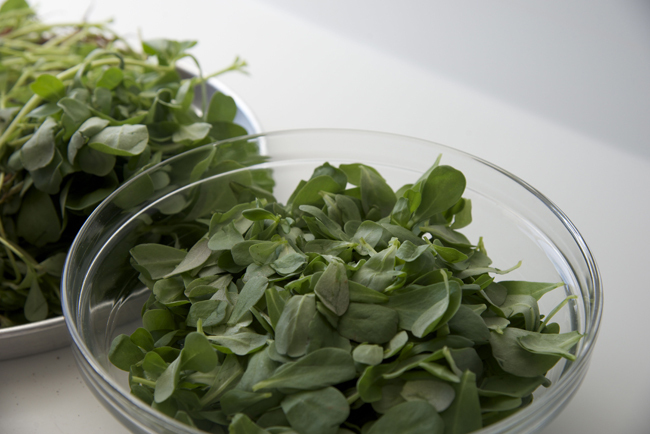 And because she has become quite forgetful, she forgot to add the pepper to the chopped onion before she mixed it with the purslane. Fortunately she remembered in time and added it to the mix. She also decided to pep up the filling with a little Aleppo pepper which was a very good idea. And there is the purslane filling, beautiful and still fresh looking despite my mother washing the leaves. Admittedly the purslane was very fresh when I bought it. 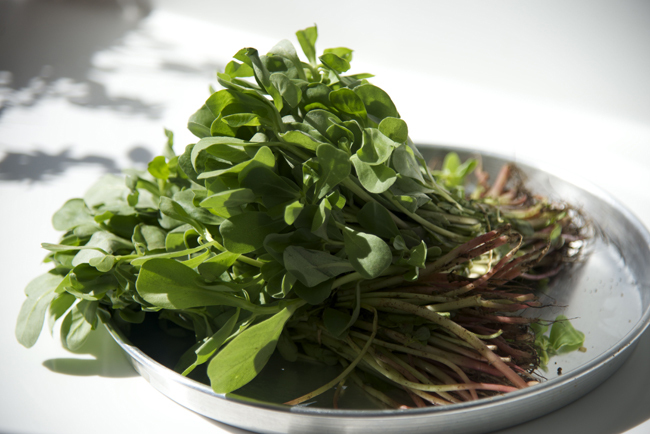 After being ignored for years by chefs, purslane is now becoming quite trendy. I saw it everywhere when I was in America recently although I am still waiting to see it everywhere here in London. We put a lid on the bowl with the filling and I handed the bag to sweet Afoe, a lovely young lady from Togo who looks after my mother, and we walked down to Emile who immediately rolled out some dough for his lovely helper to make the fatayer. The helper worked so fast I was not able to take nice pictures of him spreading the filling on the dough but I was able to snap him shaping the fatayer. 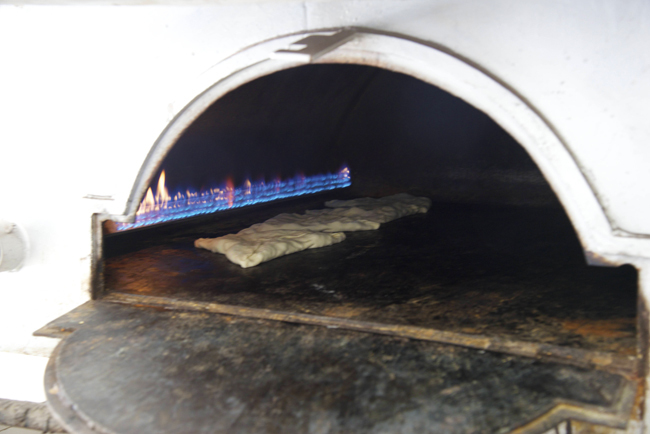 And here are the fatayer baking in the gas-fired oven. Even old Emile has succumbed to modernisation but I have to say that his oven bakes brilliantly despite it looking fairly rickety, made from sheet iron I think and totally portable, that is if you have a few strong men to lift it. Anyhow, it took only a few minutes for the fatayer to bake and they came out looking so scrumptious that I had to eat one on the spot. I asked the helper (next time I will ask his name) to cut it for me which he did very neatly and I tucked in despite the pastry being quite hot. Normally they are eaten at room temperature, at least the small ones, but I like them hot or actually warm. I burned my tongue but it didn’t matter. It was divine. My mother had seasoned it to perfection and the taste of purslane is much more interesting than spinach which is the more common filling for fatayer. 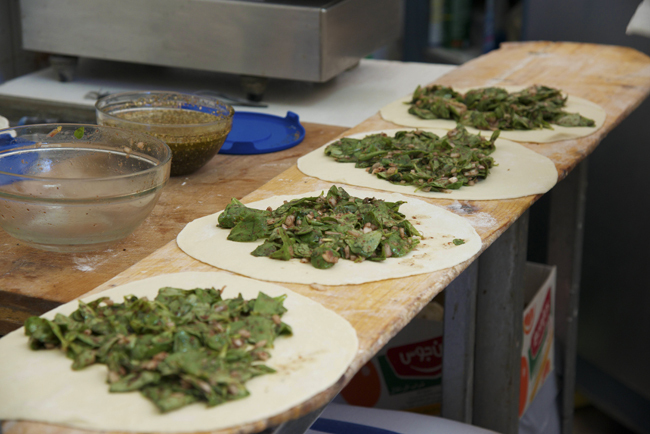 So, if you have some purslane make the fatayer following the recipe below. If you live in the west, it is unlikely you have an Emile near you but you can always bake them on the bottom of a very hot oven! 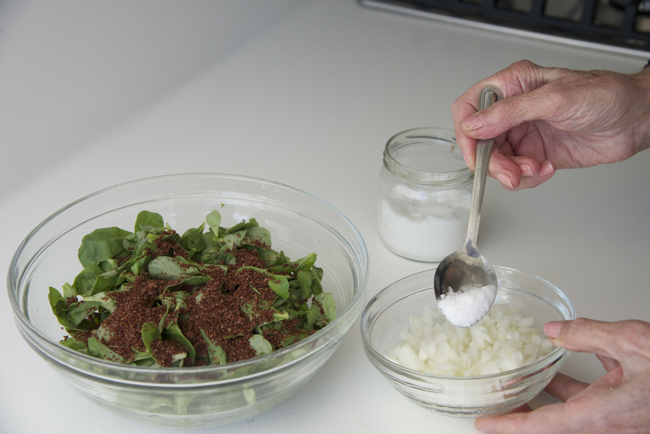 Mix the flour and salt in a mixing bowl and make a well in the centre. Pour in the oil and work into the flour with your hands until it is completely absorbed and the flour looks like grated cheese. Add 1/4 cup water and knead until the dough is smooth and elastic — you may need to add a teaspoon or two more water if the dough is too firm. 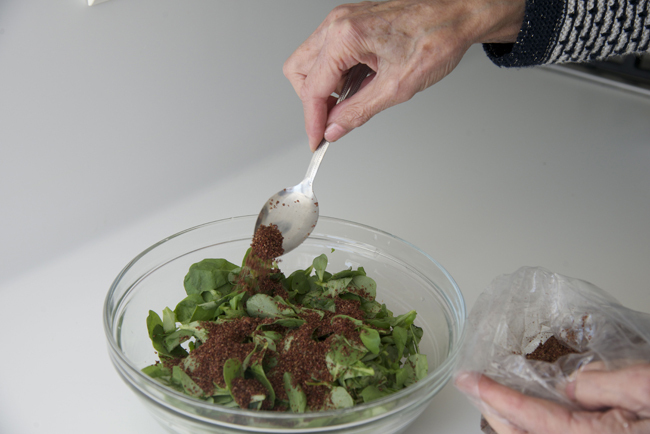 Form into a ball, cover with a damp cloth and let rest while you prepare the filling. Preheat the oven to 450 degrees and line a baking sheet with parchment paper or a silicone pastry mat unless you have a non-stick one. 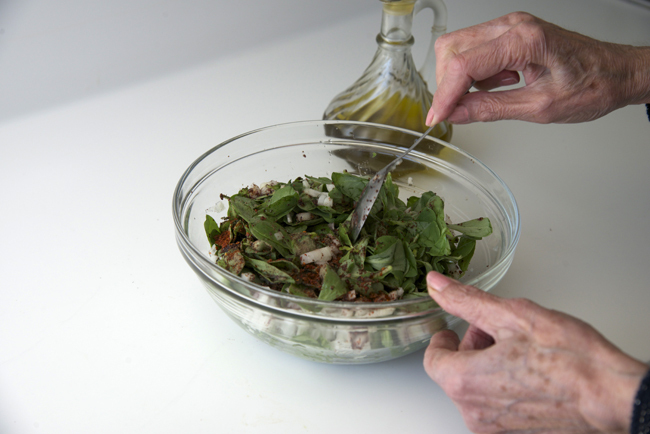 Put the purslane in a mixing bowl. 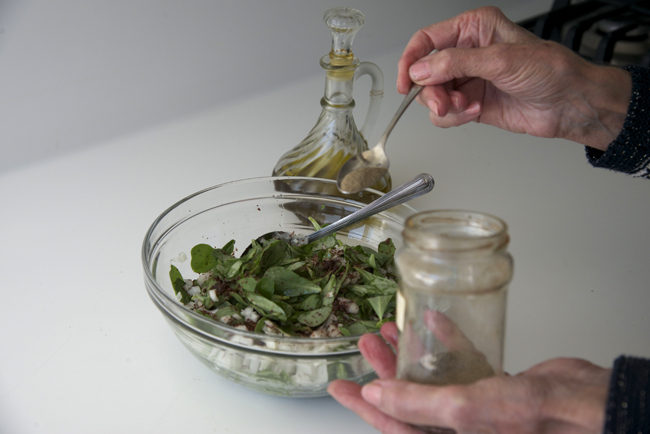 Season the chopped onion with a little salt and pepper and again rub with your fingers to soften it before adding to the purslane. 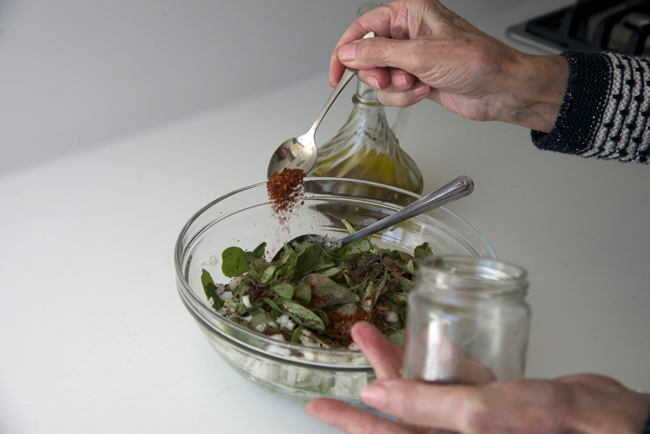 Add the sumac and olive oil and mix well. 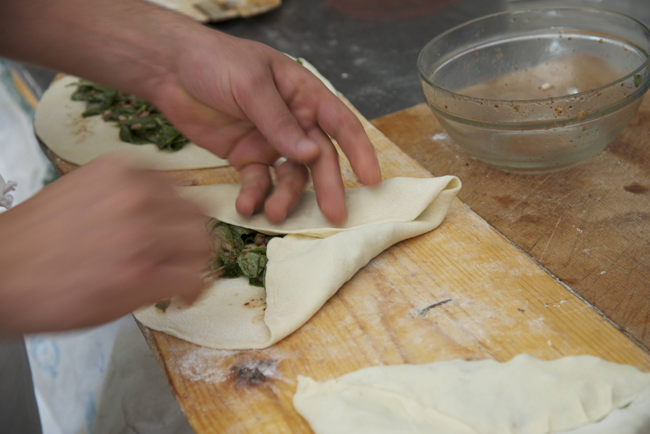 Taste and adjust the seasoning if necessary — the filling should be quite strongly flavoured to offset the mild pastry. Divide the dough into 4 pieces and roll each into a ball between the palms of your hands. Flatten one slightly and dip both sides into flour. Shake off the excess flour and roll out into a 6-inch/15 cm circle, about 1/15th-inch/1 1/2 mm thick. 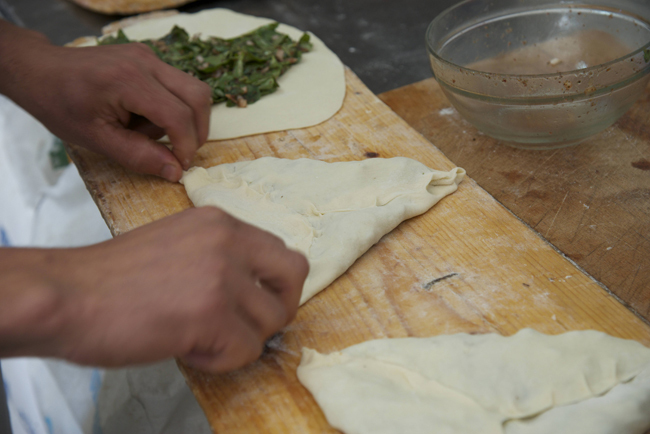 Put a quarter of the purslane filling in the middle of the circle of dough. Lift two sides, each 1/3 of the circle, and pinch together, half way down, to make a thin raised joint — at Emile they just overlap the ends pressing on them to seal them. Lift the open side and pinch it equally to both loose ends in order to form a triangle with a thin raised inverted y in the middle — be sure to pinch the pastry tightly together so that it does not open during baking. 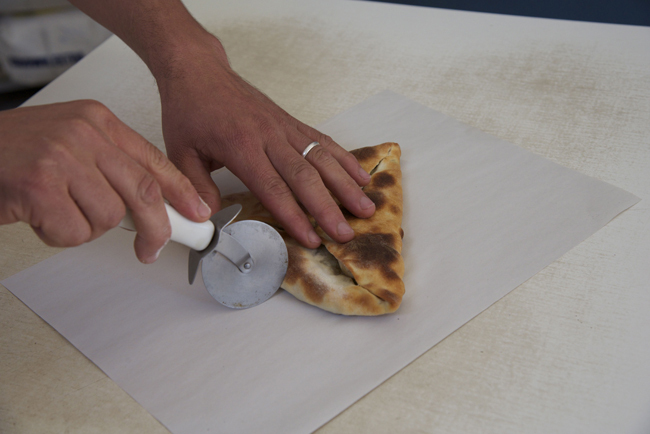 Carefully transfer the filled pastry to the lined baking sheet and make the rest of the triangles in the same way. Bake in the preheated oven for 10-15 minutes or until golden and serve warm or at room temperature. These will freeze very well either before baking or after. Dear Anissa: For years I have longed to eat fatayer the way my grandmother made it: with purslane, not spinach. She folded the pastry in the same way shown in your pictures. 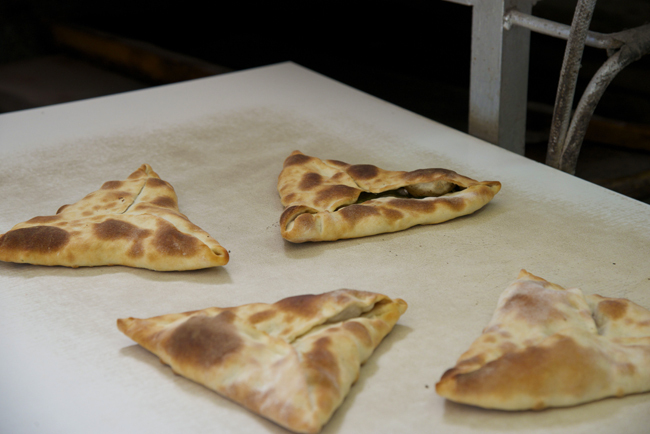 Her fatayer weren’t shaped like pyramids, they were flat. Our family was originally from Hasroun, up North in Lebanon. My grandma passed away 20 years ago and I really miss her and her cooking. I was so happy when I read your post! Now all I need is to get my hands on some purslane! Thank you very much. 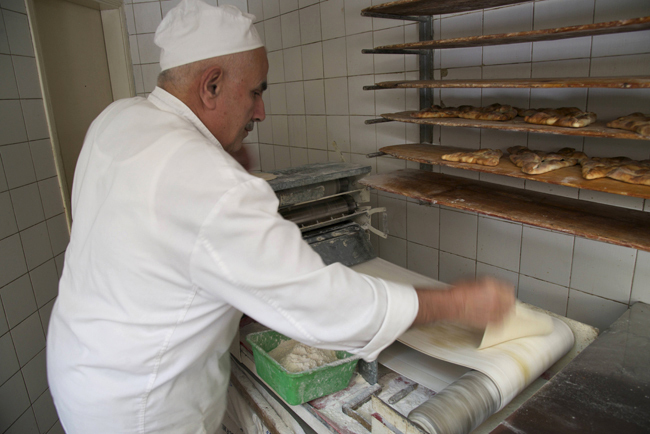 mouth is watering now,,the fatayer look exquisite…love the pic of your chic and svelte mom heading to the baker to make sure her handiwork gets done to her exacting standards im sure..